Nothing is more powerful than your thoughts and feelings. As you learn to master these, you will find you become a master creator. A positive attitude goes a long way. Should you find yourself having anything less than a bright outlook for yourself and your life, immediately look for ways to change that attitude. This does not mean that life will be without challenges. It means that you will know that you can tackle whatever those challenges are because you know there are always options or alternatives; you just need to look deeper sometimes. Spirit is always there to light up your path. Thought for today: The Universe is supporting you to Be your own light at the end of the tunnel. Know that everything is in perfect order. 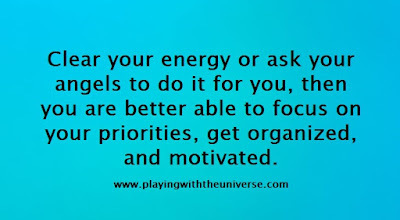 While it might not always seem so, the energy you are in the perfect energy for you and it is meant to empower you or propel you into inspired action on some level. Things are not going to remain the same for long as that is the way the universe works. 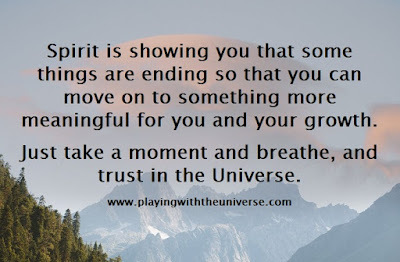 Get ready to take a giant leap forward in some way, but for now, feel your way through and know that spirit has your back. 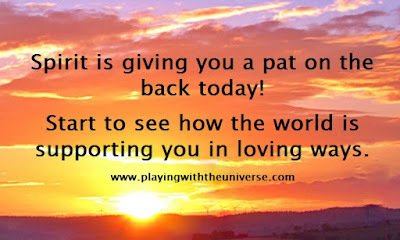 Thought for today: Spirit is giving you a pat on the back today! Start to see how the world is supporting you in loving ways. Step back and take a look at the bigger picture. Sometimes it is easier to see things as small and insignificant, but that is doing yourself a disservice because you are meant for so much more. If things are not clear, take a moment and step back, take a deep breath and gather information from your senses. Try to observe things from the perspective of your higher self or your angels and observe with the pure awareness of love and an open mind. 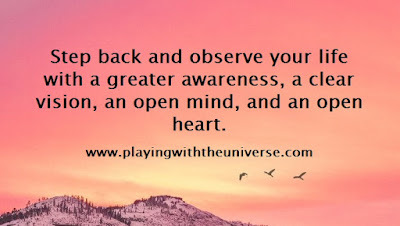 Thought for today: Step back and observe your life with a greater awareness, a clear vision, an open mind, and an open heart. Take time to relax and enjoy the gifts life has to offer. 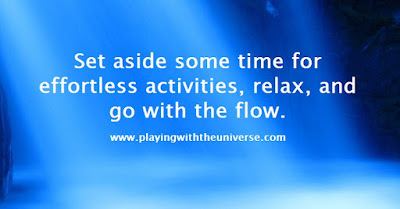 Enjoy and honour your own energy as well as taking time out to relax and enjoy. Set some healthy boundaries and use them to play a little more and work a little less. Explore aspects of yourself and how you interplay with the different areas of life and love every part of you. 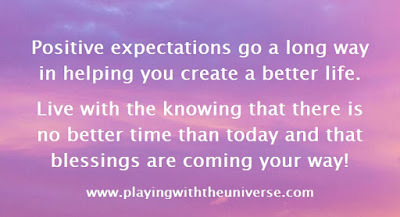 Thought for today: Positive expectations go a long way in helping you create a better life. Live with the knowing that there is no better time than today and that blessings are coming your way! Things are not always as they seem when you are navigating the world of the physical. Stay true to your inner knowing, what you know to feel right and true, and you will be doing just fine. There is always a level of trust when you leap forward into the unknown, but your thoughts and feelings are the best tools to use to assure a safe landing. Blessings are all around you when you choose to look, as are sorrows, so choose wisely where you hold those thoughts and feelings, and you will see a great difference in your creation process. 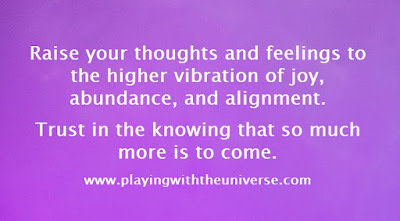 Thought for today: Raise your thoughts and feelings to the higher vibration of joy, abundance, and alignment. Trust in the knowing that so much more is to come. 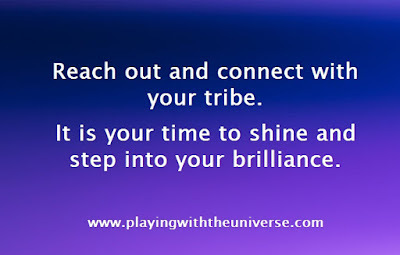 Raise your potential ~ Angel Wisdom, Sharon Taphorn. You are becoming more powerful creators as you honour who you truly are and begin to take charge of your believe in yourself, your abilities to create, and your abilities to see the signs that are the answers that you seek. You are a powerful being, and it is time to take charge, raise your expectations, and allow those goals, dreams, and desires room to grow. You don’t need to know the when or the how’s, just trust it is unfolding and pay attention to enjoying each moment of your now. Be methodical in your approach. Make some plans right now that are focused upon your goals and desires. You are in prime creator energy and intention is half the equation. As you make these intentions known, you will find that the perfect action will take place. The trick is in being really clear and decisive as you put all of your thoughts and feelings into what you really, really want. Find sanctuary in nature and let the elemental kingdom help you with your creations. They are able to travel the dimensions in ways you are just learning and would love to help you bring your creations into fruition. 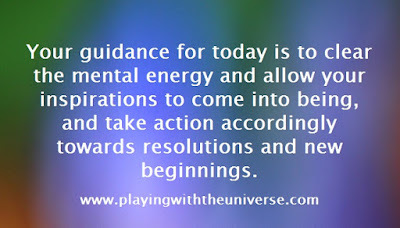 Thought for today: Today, take some inspired action towards your dreams. 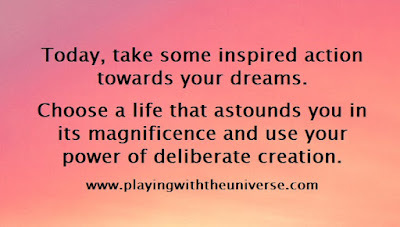 Choose a life that astounds you in its magnificence and use your power of deliberate creation. You have been making steady progress assimilating the changes that are happening around you. It might not all be unfolding as fast as you would like it to, but really it is you who is controlling how this all plays out. It doesn’t always seem like that while you in the midst of change, but rest assured, you have the talents and skills you need to navigate these changes and they are the very ones you have been asking for. 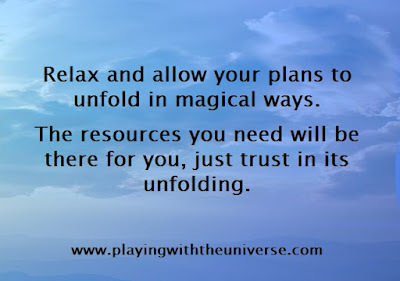 Thought for today: Relax and allow your plans to unfold in magical ways. The resources you need will be there for you, just trust in its unfolding. Balance Living a balanced life. Your angel guidance for today is to find your balance and remembering how important it is to look at all aspects of your life with equal importance. Let your goals be focused more on creating a life that feels good! This will assist you on your mission and is part of your purpose in this life. It is time for you to know that you are worthy and to believe that too with all of your heart. We often live in the mental world more than any of the other. When we do this, it creates a huge imbalance and if often the root of much dis-ease. It is a good time to put our thoughts in order and understand their origins. Are your thoughts and mental world working with you or are they blocking the results you desire. 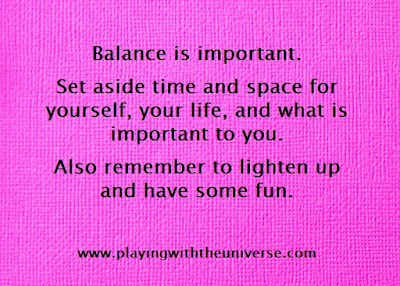 Thought for today: Balance is important. Set aside time and space for yourself, your life, and what is important to you. Also remember to lighten up and have some fun. Allow yourself to go with the flow of energy. While it is good to have goals, we want you to set your intention each day to become more aware and in the flow of the cycles and rhythms of life. These affect your physical body, your energy levels, and your emotions, which in turn affects your outlook and the results you receive. 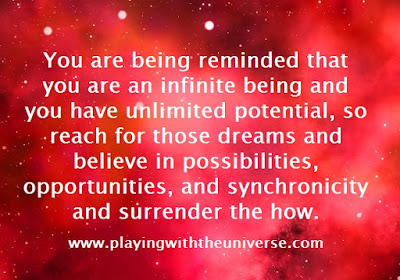 The clearer you are about those intentions, the better they can manifest into reality. 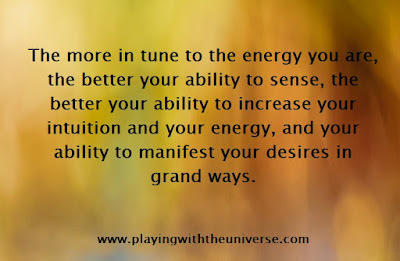 Thought for today: The more in tune to the energy you are, the better your ability to sense, the better your ability to increase your intuition and your energy, and your ability to manifest your desires in grand ways. Communication with your council of light. The potential for higher communication and discovering your own inner truth is greater right now and you might find that you have been missing pieces of time or are having deeper meditative experiences than you are used to. Trust that more is going on that meets the eye and learn to automatic write or journal to help you re-remember. The ability to tune into the cosmic consciousness, the information from the ascended masters, and your own council of light is easier now because of the work you have been doing, so keep doing it. This will help you trust your own messages as guidance, trust in your discernment, and trust in the synchronicities to make them all happen. 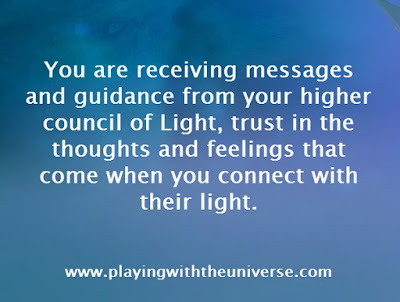 Thought for today: You are receiving messages and guidance from your higher council of Light, trust in the thoughts and feelings that come when you connect with their light. A powerful tool for this great shift is learning to adapt to the energy, becoming more flexible, and trusting in your personal power of discernment. The better you learn to work in the energy fluctuations is your adaptability, or learning to follow the flow by reading the energy. As you do this, you will find your confidence soars and your ability to know when to act, when to maintain, and when to retreat for a bit. It is part of the process of letting go of the mental energy and trusting. Thought for today: Don’t overthink things. 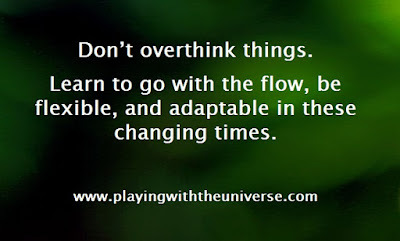 Learn to go with the flow, be flexible, and adaptable in these changing times. You are becoming sensitive in new ways. As you become aware that you are now more sensitive, it helps you make a bit of sense to the feelings you have been experiencing lately. 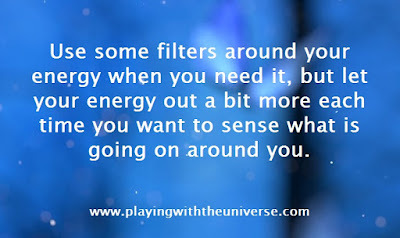 It can be a confusing time when you get caught up in the energy, but that is your signal that something is happening and to delve deeper. It might be wise to avoid harsh relationships, chemicals, and situations while you are learning to master these thoughts and feelings. Thought for today: Acknowledge and honour your sensitivities. 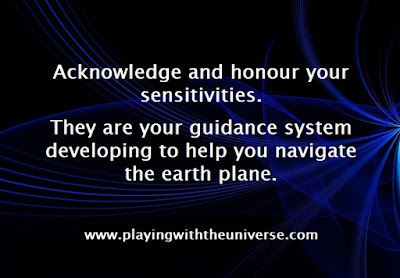 They are your guidance system developing to help you navigate the earth plane.